From individual designer through product development collaboration to the manufacturing department, Stratasys offers FDM and PolyJet 3D printers designed for you. You aren’t just turning on any 3D printer — you’re revving up an idea engine. Stratasys Idea Series systems fit nicely onto your desktop and even better into your budget. See and hold your idea, even at its earliest stages. Test it, talk it and perfect it like never before. What are you waiting for? Get behind the wheel of 3D printing and take your idea for a spin. Liberate your creativity. Accelerate your design process. 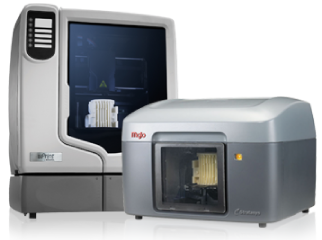 A Stratasys Mojo, uPrint SE or uPrint SE Plus 3D Printer brings professional 3D printing to your desktop or small team workspace. Soon, you’ll be asking yourself how you ever got through the design process without one. Size up each system to find the affordability and speed right for you — then harness the power of 3D printing!